This article contains information about the issues that you might encounter while using Unified Service Desk for Microsoft Dynamics 365, and how to resolve them. The article will be continuously updated as we discover more issues or resolve the existing issues in the future version of Unified Service Desk. This article is closely monitored. Any changes made to this article by others will be evaluated, and then quickly accepted, refined, or reverted. Because this is a wiki, additions or refinements to this article might have been made by community members. To read the "last official" version of the article, click here. Hosted controls configured using the IE Process hosting mode might experience random focus issues. This can be seen as focus jumping to adjacent application tabs when user clicks on Menu/Sub-Menu buttons. When hosted controls are hosted using the IE Process mode, under the cover it's an Internet Explorer process that is hosted within the Unified Service Desk shell. The Internet Explorer process steals focus from the Unified Service Desk shell, which causes the observed behavior. Create a Windows Class Library project in Visual Studio. Specify the name of the project as USDExternal. Add references to the following Unified Service Desk assemblies in your project: Microsoft.Crm.UnifiedServiceDesk.BaseControl.dll, Microsoft.Crm.UnifiedServiceDesk.CommonUtility.dll, Microsoft.Crm.UnifiedServiceDesk.Dynamics.dll, Microsoft.Uii.AifServices.dll, Microsoft.Uii.Csr.Core.dll, Microsoft.Uii.Desktop.UI.Controls.dll, and Microsoft.Xrm.Tooling.Connector.dll. 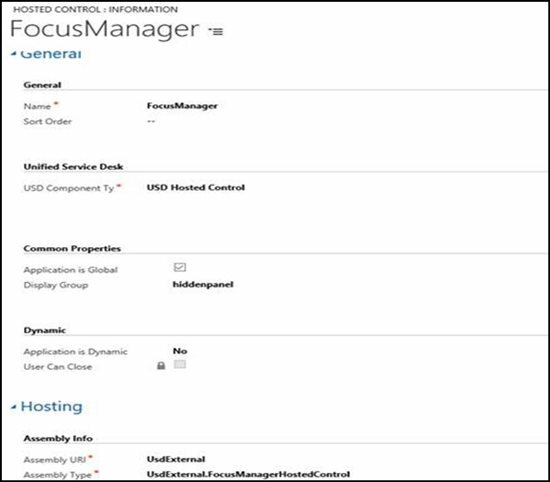 These assemblies are available in the Unified Service Desk Client installation directory, typically C:\Program Files\Microsoft Dynamics CRM USD\USD. Add references to the following Framework assemblies: PresentationCore.dll, PresentationFramework.dll, System.Xaml.dll, and WindowsBase.dll. /// This should correspond to the name of the PanelLayout hosted control defined in the configuration. /// Event is fired when a TabConrol.SelectedIndexChanged event is fired. Build the Visual Studio project. This will generate a USDExternal.dll file in the Debug folder of your Visual Studio project directory. 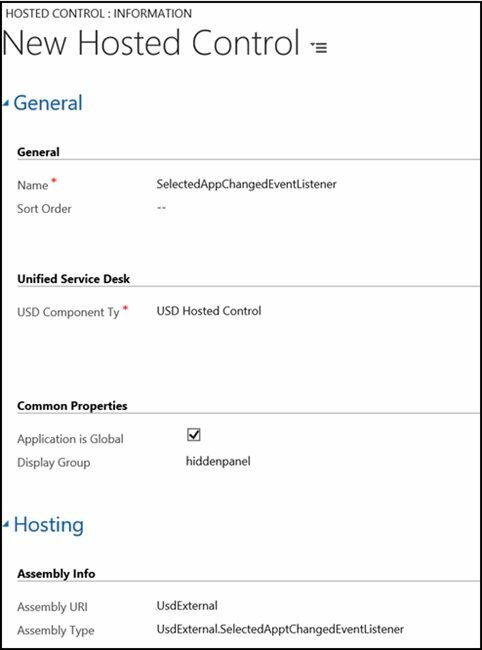 Copy the USDExternal.dll file to your Unified Service Desk client installation directory, typically C:\Program Files\Microsoft Dynamics CRM USD\USD. 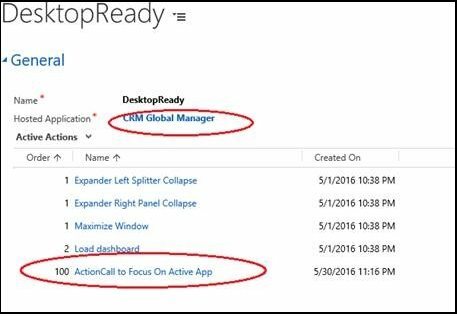 Navigate to Events, and add the action call configured in the previous step to the DesktopReady event for the CRM Global Manager hosted control. 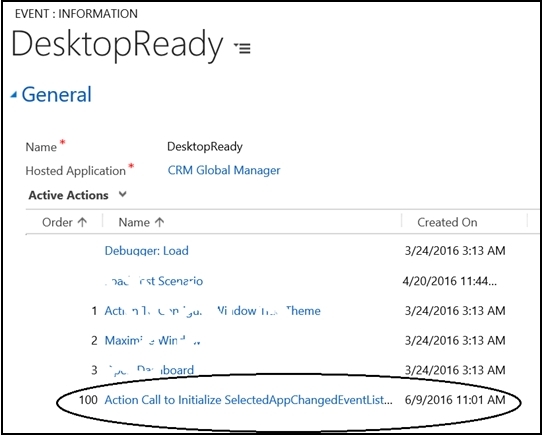 Adding this action call to any other event isn't recommended as it may degrade the Unified Service Desk performance. Run the Unified Service Desk client, and connect to your CRM instance. The focus issue should be resolved. When using hosted controls configured using the IE Process hosting mode and AllowMultiplePages = True, the data parameter is not refreshed when user switches between apps using the drop-down in a tab. The selected app changed event of the drop-down is not programmed to update the data context. Use the following approach to resolve this issue. Create a Windows Class Library project in Visual Studio. Specify a name of the project (lets say USDExternal). if (control != null) //Subscribe to the SelectionChanged event of the tab control hosted within the MainPanel. this will be the one hosting the Multiple pages dropdown within it. //this will filter the noise and only listen to events raised for MultiplePages dropdown. Run the Unified Service Desk client, and connect to your CRM instance. The issue should be resolved.